Updated Randomly since September 1995. The 95 website is still @round, sort of, trouble is, it's only available only on a corrupted Floppy Disc or on faded old A-4 print outs. Anyway, by December of 1996 the original site was looking kinda ordinary, so I hitched into Adelaide and went to ground in my favourite back packers in the world, the one behind the car park and down the lane from the offices of ircsa.com.au. For the next 6 weeks Peter Christo, Stephen "Chuckie" Fuller and I, randomly brainstormed. The creative process and synergy of those lazy Adelaide days was a turbulent time to say the least, one I'm sure none of us will ever forget. 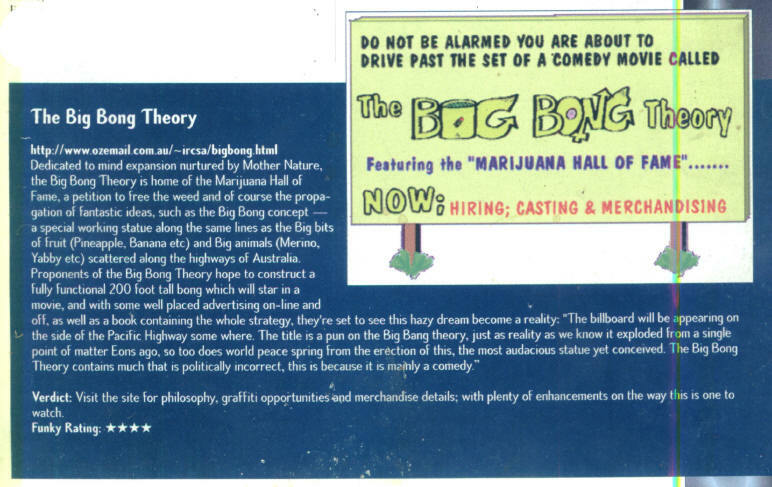 The cannabist scene in South Australia, was a constant attraction / distraction as was the summer party life style of Australia, but somehow the work got done. By morphing the Billboard Entry Image Style of the 95 site, we designed one of the first "First Scene = One Screen" web sites and Steve's idea to put the custom designed Navigation Buttons to the left proved to be ahead of it's time, several months later the "Big Boys" invented the Frames Layout. The basic way we worked was, I wrote the wwwords in NOTEPAD whilst Chuckie did all the Graphics and built the structure to a layout that Christo & I "Jointly" devised, although negotiated could be a more accurate way of describing the process. Chuckie was responsible for the basic Index Page Layout, he scanned a B&W "Big Bong Logo" and colourized it, he also invented the "Peace Spin." It was Christo to whom most of the task of unscrambling my hand drawn spaghetti looking site layouts and translating them into Virtual Reality, once again, the compromise we struck had a great sense of balance. We decided to go light on the graphics, each page had to down load in under 20 seconds, in those days dudes would swoop through a preplanned list of sites and then go off line to read from cache, nowww-adays impatience is the main factor, "Is the eyecandy worth waiting for?" so to speak, I digress, back to the wwweb design stuff, once the frame wwwas Up There, it was a simple matter for me to go into any internet web cafe or webbed up qwerty, down load a copy of the web file I wanted to update (like, say, this one ;O) and alter the "Source Code" by cutting and pasting in WORD. For a while there I felt my entire life was hitch hiking between computers and the wwweb, actually it was, 50,000 K's worth of stories, anyway, I would then hotmail the amended page to Christo and he would ftp it up to the server. The solution was created rather than found, the upshot of which is that through a complicated series of transactions and negotiations the Next BIG BONG Web Construct was woven into the USA hardweb in early 1998. How U Can Help "The Coke Joke." Support BBT "Join the Conspiracy." Read The Book "Good for a laugh or two." Graffiti Wall "Free Marijuana and other stuff." Main Index "The Hub, look for the link to the Black Square."